AFRICANGLOBE – Imagine living in a world ranging from hazy, clouded vision to that of total darkness for 30 years. Before 1985, that was the plight of those with cataracts who did not want to risk surgery with a mechanical grinder. Now imagine sitting in a doctor’s office without being able to see her as she explains that it may be possible to restore your vision. You can’t tell by studying body language whether to trust this person or if they’re pulling your leg. All you have to go by is the sound of the voice assuring you that this procedure is safe, more accurate and more comfortable than traditional cataract surgery. The difference between the old method and her new invention was the difference between the use of highly accurate laser technology and the somewhat subjective accuracy of a mechanical device. The Laserphaco Probe combined an optical laser, irrigation system and suction tubes. In use, the laser is inserted into a tiny incision on the eye; the laser then vaporizes the cataract and lens material, which is removed via the suction tubes. A replacement lens is then inserted on the eye. With the Laserphaco Probe invention and the development of the procedure for its use, Dr. Bath helped restore the sight of several people who had been blinded by cataracts for up to 30 years. 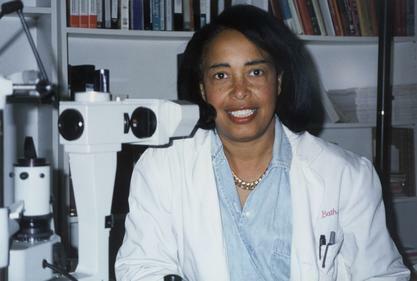 Imagine the joy they felt when they opened their eyes to see Dr. Patricia Bath’s smiling face for the first time. Next articleHow Powerful Is Egypt?